The brilliant events held by the employability team have broadened my understanding of the legal profession immensely. When I came to an NTU Open Day, there was a pleasant vibe from the beginning. The atmosphere was calm, the buildings looked modern and the lecturers were approachable. Nottingham Trent University had the best ambience and you could tell that the students were the focus in this university. Coming to NTU just seemed right for me, and being here has shown me I have made the right choice. When my mom and I were talking to the lecturer on the Open Day, they told us about the opportunity to have dinner with people from the legal profession. This highlighted to us that NTU was not only a place where I could potentially develop the vital legal foundations for a successful career, but also that my degree would not be one-dimensional. 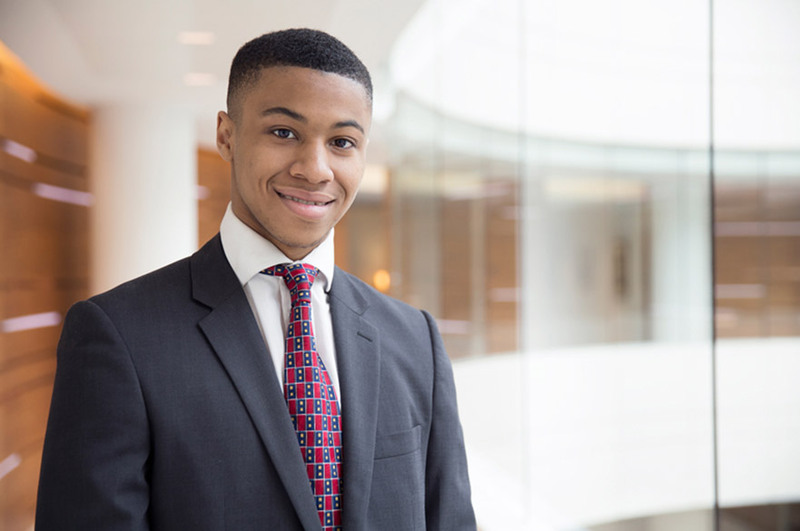 I would have other opportunities to develop my career prospects, which has been shown through the university nominating me for a Freshfields Stephen Lawrence 2016 Scholarship. One of my friends on the course told me about the scholarship opportunity. It is aimed at exceptionally talented first year undergraduate law students and seeks to address the disproportionate under-representation in large commercial law firms of black and black mixed race men from low-income households. I wanted to apply as soon as I found out more about the scholarship from the Nottingham Law School careers consultant, Edward Mosley. I knew of the firm and its values because I had applied for a work-shadowing placement with them after my second year of college. It was not a difficult decision to apply for the scholarship, especially when I found out there were no minimum grade requirements. Freshfields specified that they were looking for exceptionally talented students. They assess candidates in a unique way to test for the wide range of qualities required to become a lawyer in a large commercial law firm. Throughout the process I tried to show them my true personality. I also prepared to be resilient by waking up at 3.50 am to get on a 5.30 am train. Looking back on it, I set out to prove that I had the abilities they were looking for in a scholarship candidate. The scholarship will mean that I will receive greater insight into the legal profession through mentoring, interview coaching and other development opportunities, commercial familiarisation during the holidays and an alternative route to a training contract interview with the firm. Without the scholarship it would have been more difficult for me to gain such an insight into the profession; this is mainly because I didn’t previously know anyone who had a career in the Law. The scholarship provides such an excellent opportunity to not only network but also work with other extremely talented black men in the country who study Law. At NTU I have found the public, administrative and European Union Law modules the most interesting, especially in view of the recent UK EU referendum. My best memory was when I had my society, The New Black, ratified by the Student Union, following a presentation with my committee members. I have made a lot of progress this year but because of the scholarship and approval for The New Black, I now know I’m not on my own and have a team of positive people who are willing to work with me to move forward. Law can be difficult to grasp at first. However I have managed to balance the academic side with my personal growth quite well this year. The brilliant events held by the employability team have broadened my understanding of the legal profession immensely. I have become more of a leader by being the School Representative for my Law School. I will make the most of the opportunities the scholarship presents, and aim to enhance my employability for the legal profession through work placements including mini-pupillages and vacation schemes. I hope The New Black Society will establish itself as a community of positive people actively striving to achieve their goals, leading to greater integration in the University of people from different backgrounds. I would say if you genuinely desire to do well in the legal profession, NTU will provide you with the platform to do that. They will not force you to go to employability events, they will not force you to go to lectures or seminars and they will not force you to try and make a change in the University. But if you take up opportunities and surround yourself with others who are trying to achieve their personal goals, nothing will stop you from being the person you always wanted to be.